I’m in the middle of a little bathroom makeover. We’re trying to be budget conscious, so when possible I’m making use of what’s already there rather than buying new. 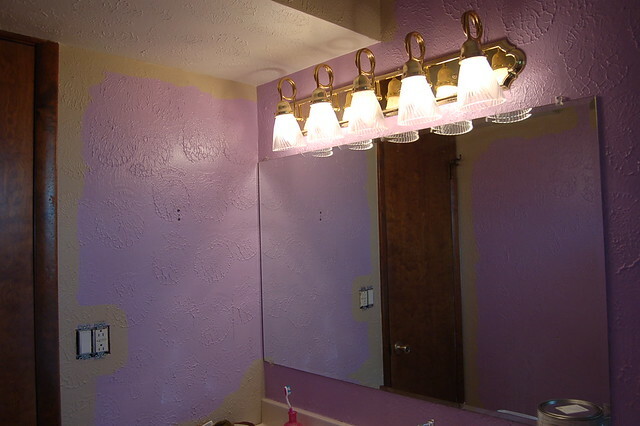 Sorry I forgot to take a true “Before” picture, but here’s the bathroom right after I started painting over the purple with a warm taupe called Ranch House. Notice the bathroom mirror, just a sheet of mirror held onto the wall with mirror clips. I measured the mirror and had molding cut to size at Home Depot, then primed and painted it on both sides. (A little of the back will show against the mirror.) Using square trim pieces at the corners avoids messing with mitered corners. I like to keep things simple. To stick it to the mirror, I used ordinary Velcro with adhesive backing. 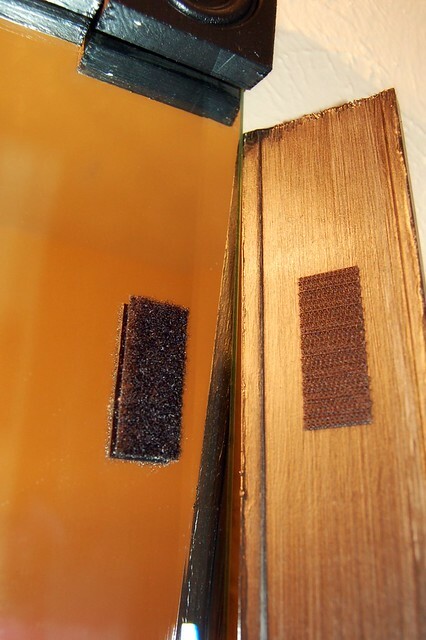 It’s much easier to stick both sides of the Velcro to itself before cutting it, then stick one side of the Velcro to the molding and push the entire thing in place against the mirror. Pushing the other adhesive side to the glass this way helps you avoid trying to match up separate Velcro pieces. It really doesn’t take much Velcro at all. I just used a two pieces a couple inches long on the longer boards, and just a small piece at the corners. Then just fit your pieces together. 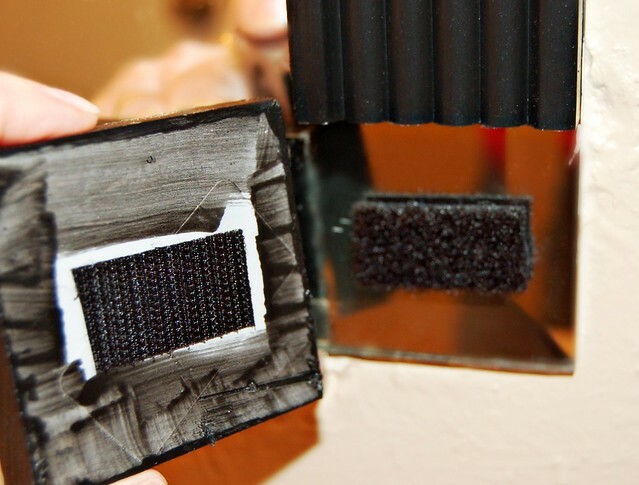 The Velcro gives you a little wiggle room in case your wood cuts weren’t perfect. There’s still a lot to be done, but I’m very happy with my “new” mirror! Love it! Great start to your remodel Sarah! love it! what a great, economical idea! Looks amazing, you are so creative. I’m so glad I came across your posting. I want to add a frame to the bathroom mirror of the home I’m renting, but was hesitant to use mirror glue like everyone else has instructed. I am going to use this DIY for sure! Thanks! 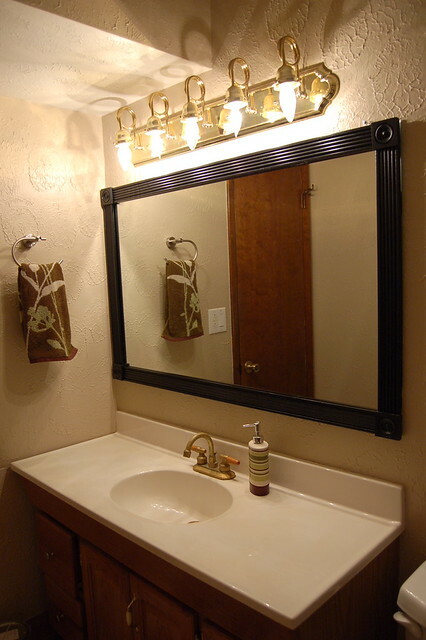 Just completed a mirror in my bathroom using your techniques. Love it. My very large mirror was losing the silver along the bottom edge. The new frame hid that and added a nice update to a tired look. Thanks so much for posting the instructions! I framed a mirror this week using your method. It was very easy and looks great! The Velcro option, to me, seemed better than using liquid nails. It is nice that you have the ability to adjust your frame after it is up. Thanks for the tutorial! Velcro-such a good idea. I would never have thought of that. Its perfect for the job. You’re my hero! The velcro is genius!! Ive been trying to figure out a way to do this in my apartment without glue! Yay! Does the heat from the lights cause the glue on the Velcro to melt at all? Hi Laurie! Not so far. This is in our downstairs bath, which we don’t usually shower in (guests do), but it is most used through the day. In five years, I’ve only had to replace one piece of Velcro. 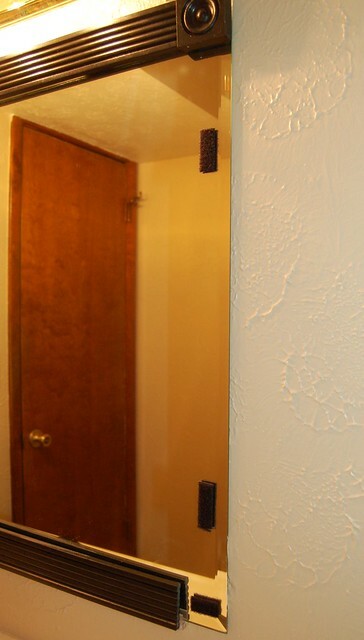 We’re selling our old condo & was looking for a way to not replace the big old (but still in good shape) mirrors without spending more $$ to redo anything else. The ugly old clips just make it look bad so this is the perfect fix! What a great idea!! Thank U!! OMG! This is brilliant! I’m about to move and saw this post. I’ve had it pinned on Pinterest for a while and I plan on doing this in my new rental. Already bought all of the lumber, stain, and poly. Did you use a poly? I thought it would be good just because this will be in the bathroom and it would keep the stain from running or the lumber from bowing. Anyways, looking forward to see how it turns out! Hi Lauren! I’m sorry I’m so late responding. No, I don’t think I used a poly. This mirror is in our guest bathroom, which is also our main downstairs bathroom. (So the room isn’t used for showers all that often.) I think the poly would give a good finish and certainly wouldn’t hurt! Six years later, ours still looks great.